The new year is here, bringing with it lots of snow for the Kansas City area and the start of another tax season. Despite the ongoing government shutdown, the IRS has announced the 2019 tax filing season will officially begin on January 28th. However, it won’t just be another year, another tax return for most taxpayers. Your 2018 return will be the first filed under the new laws enacted by the Tax Cuts and Jobs Act. Amongst the sweeping changes to the tax code ushered in by the bill, the increased standard deduction and the paring back of popular itemized deductions are likely to be the most impactful for individuals. The standard deduction for 2018 is nearly double that of 2017, increasing from $12,700 to $24,000 for married couples filing jointly and $6,350 to $12,000 for single filers. In contrast to the increased standard deduction, the new law limited, and in some cases repealed, many commonly utilized itemized deductions. These include a $10,000 maximum deduction for all state and local taxes paid (including both income and property taxes), a reduction in the acquisition indebtedness limit from $1M to $750K for deductible mortgage interest, and the elimination of the entire category of miscellaneous itemized deductions subject to the 2%-of-AGI floor. These changes are significant in that a substantial number of individuals who have historically itemized deductions on their tax returns will no longer itemize starting with their 2018 returns. Over the last decade, roughly 30% of Americans have itemized each year, per IRS data. Under the new tax laws, the Tax Policy Center estimates only 10% will itemize in 2018. 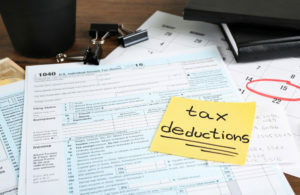 With the threshold to exceed the standard deduction so great, many are turning to a deduction bunching strategy to maximize the tax benefit of their expenses. Deduction bunching is a tax strategy aimed at shifting the timing of deductible expenses, bunching them together within the same year, to surpass the standard deduction amount. The goal of the strategy is to time your deductions in such a way that you can itemize every few years, while falling back on a high standard deduction in the interim years. Unfortunately, the difficulty of deduction bunching is that the timing of most deductions cannot be shifted. Some itemized deductions that provide timing flexibility are medical expenses and state and local taxes (if you make state estimated tax payments). However, there is a very common deduction that provides flexibility in both timing and amount, making it an ideal candidate for a deduction bunching strategy. That deduction is the charitable contribution. Most individuals maintain a charitable giving approach that is consistent year-over-year. This has been the preferred strategy for taxpayers and charities alike, but with the rise of the standard deduction the tax benefits of such a strategy have waned significantly. Luckily there is a vehicle that will allow you to make several years’ worth of contributions in one year, taking the tax deduction up front, all while retaining the benefit of spreading out your actual gifting over multiple years. A donor-advised fund is a tax-exempt public charity through which donors can make contributions to a private account, receiving a full tax deduction in the year of contribution, and subsequently advise on how their charitable gifts are to be invested and ultimately distributed out of their account over the course of many years. Receiving a tax deduction for multiple years of charitable contributions in a single year makes deduction bunching a viable tax strategy for many people. In addition to an immediate tax deduction for several years of gifting, contributions can build up tax-free for years before being distributed to a specific charity, amplifying the benefit of the original gift. A donor-advised fund is like a private foundation in purpose, but requires far less money, time, and effort to establish and maintain. As the fund’s sponsoring organization handles the legal, administrative, and filing requirements, the donor is free of the operational burden and can focus solely on the charitable nature of the fund. Funds even allow donors to contribute marketable securities and other appreciated assets, in addition to cash. This not only facilitates the liquidation of the assets for contribution but also avoids any capital gains tax that would have been generated from the sale of the appreciated assets. The donor-advised fund is a great option for those looking to streamline their charitable giving while not forfeiting the tax benefits. Its many advantages make the donor-advised fund a valuable part of any charitable giving and tax planning strategy. Windward will be hosting a Donor-Advised Fund Lunch n’ Learn in conjunction with the Greater Kansas City Community Foundation on Friday, February 22nd. We encourage anyone interested in learning more about donor-advised funds to attend. You can click here to register for that event. For more information regarding donor-advised funds, please contact a Windward advisor at either our North Kansas City or Overland Park office today.